Harts Barn Cookery School & Crafts - Wanderlust Camper Co.
HARTS BARN IS A TRULY UNIQUE VENUE, LOCATED IN THE BEAUTIFUL FOREST OF DEAN, GLOUCESTERSHIRE OFFERING COOKERY CLASSES, PARTIES, BESPOKE EVENTS & VENUE HIRE. PLUS SUPPER CLUBS & A LICENSED BAR! Ideal for a family or group party activity (whatever the weather). ​enjoying the bar or supper club in to the evening. Cook, create, party and dine overlooking the beautiful Gloucestershire countryside in the Forest of Dean. Create your perfect party. A Harts Barn chef can come to you. Using local ingredients where possible, all you have to do is relax and enjoy the great food and service. The Apple Barn provides a great dining area, bar facilities and party venue - a flexible space that can be used for a wide range of events. ​or for an experience to share with friends, family, for a birthday or celebration. Prices for Hen and Stag Parties start at £35pp dependent on how much cooking is involved. To discuss your requirements please call 01452 831 719 or email: info@hartsbarncookeryschool.co.uk. Harts Barn's glass fronted, purpose built cookery school has been built to absorb and showcase its surroundings. They offer an outdoor earth oven and fire pit with outdoor seating that can also be hired for any event or party. 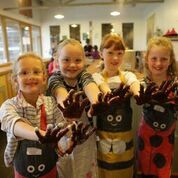 We can work with Harts Barn and a selection of our workshop artists and activities to add extra elements to your celebration party. Take a look at our events page for more ideas and please contact us to discuss your requirements.